Once students have learned how to effectively plan their term papers, the next step is to learn how to write their first drafts as well as revise and edit these drafts. Any professional writer will tell you that it’s impossible to write a perfect first draft, so it’s important to forget about perfection and instead focus on the process of writing. By learning the basic term paper structure and how to visualize a term paper, writing the first draft won’t seem so difficult. Keep in mind that it’s okay for your draft to be rough and contain errors- the important thing is that you keep writing. Remember, you can always make changes later. Don’t let writer’s block stop you from writing. If you get stuck for ideas in one section, move on and come back to that trouble spot later. When writing a draft, the main idea is to focus on the ideas you can get down. Use your outline. Drafting an outline is an important component of planning a term paper. Try to write your first draft in one sitting. Again, it’s okay to skip a section if you get stuck. Write the way you speak. Many students feel they have to use elevated language and complex sentence structures when they write academic term papers. Trying to do that in a first draft is a recipe for trouble. Pretend you’re communicating your ideas to a friend or to a fellow student, and write in the language that comes naturally to you. As you continue through your college education, you will often find yourself using definitions in different disciplines. In term paper exams, you will use extended definitions to demonstrate your understanding of a complex topic. For example, you could be asked to define the term “Romanticism” in a literature class or the term “enclosure” in a history class. In addition, you may find yourself defining the term “social Darwinism” in a sociology class or “photosynthesis” in a biology class. If you need help with writing your term paper custom, you have an opportunity to get individual help of professional writers at our site! 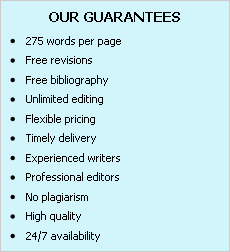 We deliver originally written term papers and we do not plagiarize!